For centuries men have fought on this earth, whether it be for family, for work or for love. Real men have a cause. Something worth fighting for. It doesn’t have to be to end world hunger, it can be to get the last copy of that new romcom in time for date night. Boys deconstruct. Port Authority represents the real men of the world; we encourage them to fight for a reason and to do it as comfortably and as stylish as possible. These men will wear Port Authority’s Long Sleeve Silk Touch Polo for maximum comfort and character. 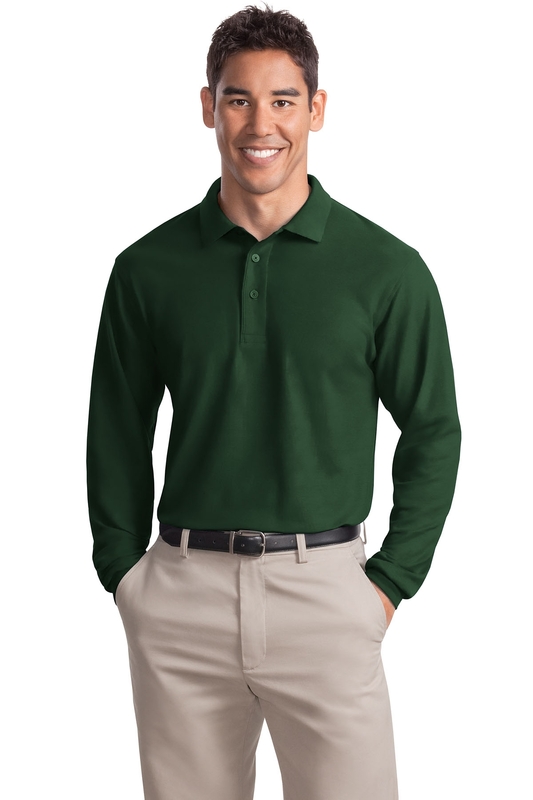 Port Authority’s Long Sleeve Silk Touch Polo is a great choice for the active man. There’s no doubt that for sports such as hillwalking, tennis or golf it is a great choice. However, it works just as well if you are working in the garden, putting together furniture, doing housework or you can wear it casually. The Port Authority Long Sleeve Silk Touch Polo is well suited for businesses and organisations that look to uniform staff. A simple yet loved style would see any group look professional, approachable and ready for anything. The colour range for the Port Authority’s Long Sleeve Silk Touch Polo covers all the core colour groups. It is available in; Black, Burgundy, Coffee Bean, Cool Grey, Dark Green, Navy, Red, Royal, Stone and White. This range really shows the versatility of the long sleeve polo, whereas the Royal colour has been really popular with businesses, the Coffee Bean has become a firm favourite with casual wearers of the top. Our Silk Touch Polo is soft, supple and easy to care for. The silky smooth pique knit resists wrinkles. The super light 5 ounce weight, the soft 65/35 mixture poly/cotton pique, the stylish flat knit collar and cuffs, same colour matching buttons, double-needle armhole seams and hem finished with side vents which make this garment comfortable in any climate. The classic long sleeve style looks great on absolutely everyone, no matter the size as there is such a variety. Adult sizes go from XS, S, M, L, XL, 2XL, 3XL, 4XL, 5XL and 6XL. So if you’re a real man, with a will to live, prosper and inspire, make sure you don’t waste all that by wearing the wrong attire. If you have a cause worth fighting for, make sure you fight for it wearing Port Authority’s Long Sleeve Silk Touch Polo.